Just a quick pic from the wedding at the weekend. 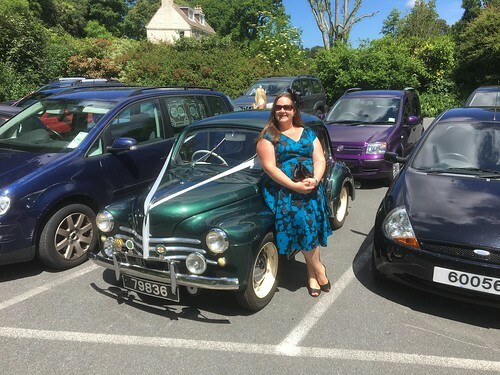 This is my Auntie Pat’s car and I love it… I also loved my dress and felt really glamorous. What a fab wedding. Today my cousin Jeremy married the lovely Rebecca. It was a perfect day. 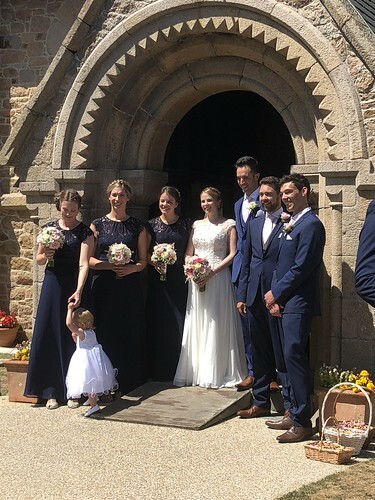 Sunny, but not too hot, the bride looked gorgeous and the bridesmaids scrubbed up nicely. 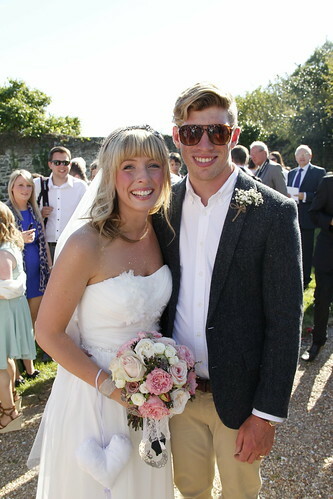 The groom looked ok too! There was also an obscene amount of alcohol and I managed to get through more than my fair share! I was going to put up a pic of the bride and groom but I didn’t get a decent one, but I was particularly impressed with how gorgeous the flowers were. Such vibrant colours. Gorgeous. Today my little cousin Stefanie married Rhys. It was the most wonderful day and the weather was kind to us. The wedding was one of the nicest and the most entertaining ones I have been to, largely because Stef had the most wonderful vision for it and so many people worked extremely hard to make it happen. Sorry Rhys, you don’t feature in the picture for today though. 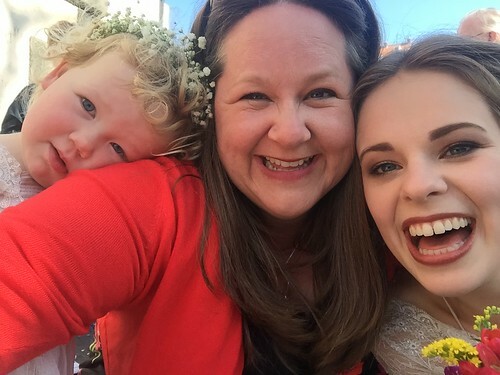 I love this picture… Stefi is The Little Miss’ godmother and she couldn’t wish for a better one. Stef is generous and kind and she will always go the extra mile to do something for someone else. She is like a little sister to me and as annoying as she is at times (like most little sisters are!) she is also fantastic. Our lives have been enriched by having her around so much but she is now heading off to spend a couple of years living in New Zealand with her husband. We will miss her so much. We love you Stef and Rhys. Your wedding was wonderful and we know that your marriage will be the same. Stay in touch please! Today has been a brilliant day because my lovely cousin Chloe got married to Pete. It was the perfect day for a wedding, sunny and bright, if a little bit windy. Unfortunately children were not invited to this wedding so The Mister stayed at home with them and I went with my sister and our Dad. We do like a good family knees up. A good wedding, lots of prosecco and some entertaining speeches. We wish you all the best for your future Chloe & Pete. It was a lovely wedding. Four years ago today I married my best friend. We had a wonderful day celebrating with our friends and family and I look back with immense happiness, even though the weather was appalling. Over the last few months The Mister has been amazingly supportive and generous and he was helped me immeasurably to deal with Mum’s death. I am absolutely sure that without him this would have been an even more difficult 6 months. He is amazing and I am very fortunate. Today we went to my cousin’s daughter’s wedding. It was an absolutely beautiful day. 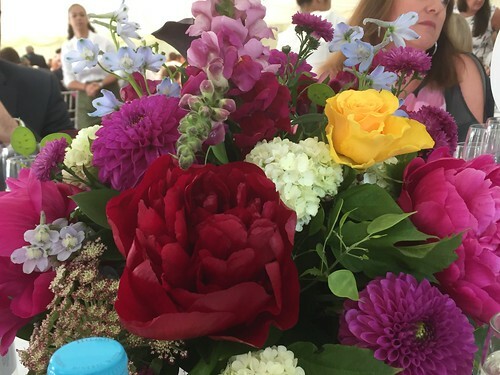 The weather was hot and sunny and the reception was in a lovely marquee in a field. As they had got married at the registry office the whole thing was quite informal. The food was delicious, barbecued meat, salad and strawberries, cream, meringues and brownies for desert followed by cakes for the evening do. I know I should have pictures of the very beautiful bride and groom for my photo of the day but I didn’t really get many decent photos of them. 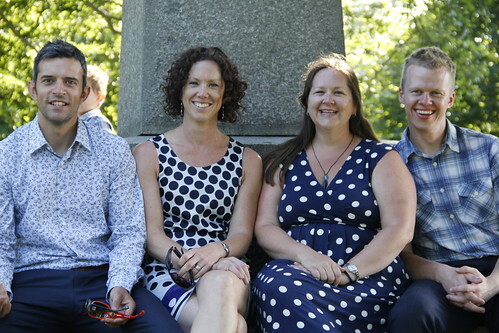 Instead, we have this picture of my brother-in-law, sister, me and The Mister. It’s nice to have a photo where we all look so happy…. and co-ordinated! Today The Mister, Mum and Dad and I spent time at the house, cleaning out the garage and stripping woodchip off the walls. For those who want to see house pics click….. here. This afternoon Mum, Stef and I went to the wedding service of my mum’s cousin’s daughter (typical Guernsey relationship explanation!). 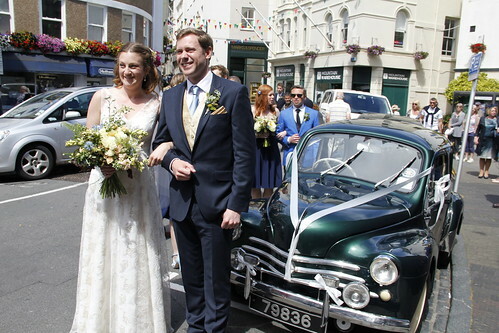 Lucy and Luke looked wonderful and it was such a gorgeous day. Her dress was absolutely stunning, really classic and suited her perfectly! Several people asked me what was going to be my photo of the day, but obviously I decided it should be the bride and groom. They were only too happy to oblige and pose for a photo when I said they would be pic of the day! Before we left yesterday we went to the water-logged marquee to help with a bit of packing up and I wanted to collect my bunting. I was more than a little annoyed to see the marquee blokes just ripping it down. They hadn’t really considered that it took someone (i.e. me!) hours to make! Anyway, it has all been washed, dried and is waiting to be fixed. 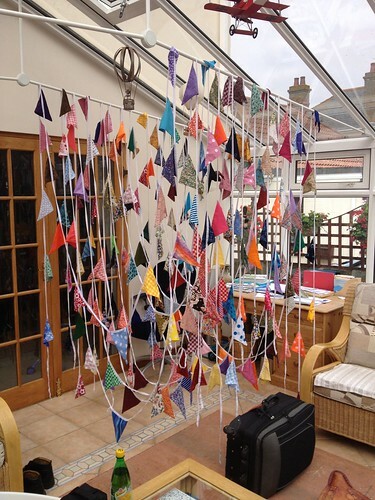 So, this is what 110m of bunting looks like all draped in the same place! I still love it though! OK, I have to admit that this photo wasn’t taken today but these pics have been kept secret. 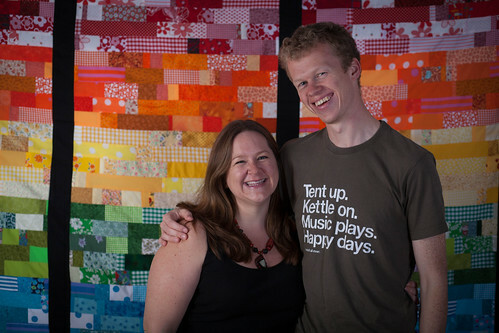 I made this quilt for Sam and Sally as a wedding present. It ended up being bigger than I thought, about king-sized because it grew and grew. 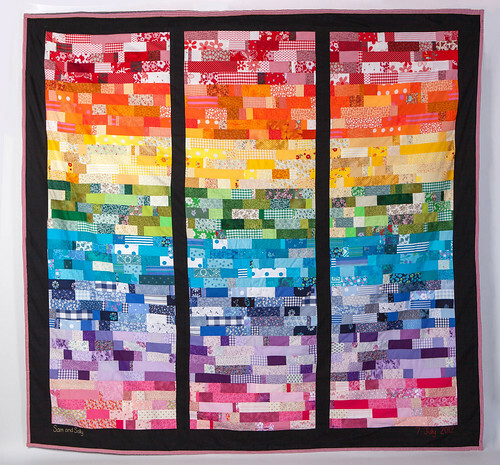 I wanted it to look liked a rainbow stained-glass window. I know Sam and Sally love everything rainbow coloured! It was an easy quilt to make. I cut fabric into the same width but random lengths and then machined them together into a long length. I was then about to cut them to the right width and sew them together after that. It was a big job based on the size rather than the complexity of the job! I love the end result and I hope the bride and groom appreciate how much time and love went into making it. 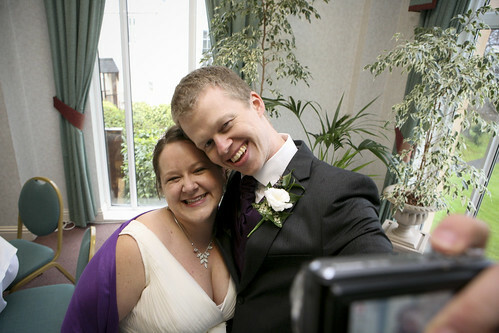 These gorgeous photos were taken by my friend Yasmin who is the very talented lady who took the wedding photos. She did a brilliant job so follow the link to her blog to take a look! Here is another photo that Yasmin took but if you want to see the whole set then click on the pic and go through to Flickr. She took some gorgeous pictures!